This entry was posted in Air Conditioning and tagged Indoor Air Quality, Tucson on November 6, 2014 by coolbreeze. The indoor air quality in your home affects the way you breathe. If you do not have good indoor air quality, you and your family might be exposed to potentially harmful contamination that can spread germs and cause certain air problems. Keep reading to learn about the major causes of poor indoor air quality. Mold, bacteria, and viruses are some of the leading biological pollutants that affect the air quality in your home. Pollen, animal dander, and even dust mites or cockroaches might also affect the way you can breathe at home. If these biological pollutants affect your air quality, it might lead to infections, allergic reactions, or even asthma attacks. If you or anyone in your home smokes, you probably have poor indoor air quality. Secondhand smoke has more than 200 poisons like carbon monoxide and 60 chemicals that increase the risk for developing cancer. If secondhand smoke is polluting your indoor air quality, it puts your lungs at serious risk for health problems like lung cancer, pneumonia, and respiratory tract infections. Certain appliances like a furnace or a fireplace might release combustible pollutants that negatively affect your air quality. Most of the time, these combustion pollutants are the result of colorless and odorless gases. Carbon monoxide and nitrogen dioxide are impossible to see, but they can have a negative affect on your health. If you are exposed to extremely high levels, it can even cause death. Older homes often have asbestos in the carpets, the particle boards, and plywood paneling. Asbestos is made with formaldehyde, which can pollute your air quality and lead to serious health issues. The experts at Cool Breeze Comfort Solutions can come to your home to improve your indoor air quality. We provide air cleaners and air filtration systems that can improve the air that circulates through your home. 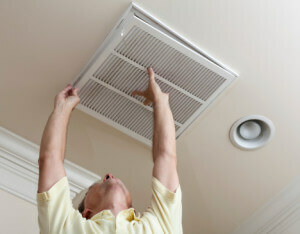 We also offer air duct cleanings. To learn more about our indoor air quality or our heating and cooling services, call 1-844-550-5300. This entry was posted in Air Conditioning and tagged Air Conditioning Maintenance, Tucson on June 5, 2014 by coolbreeze. Air conditioner filters have to work in overdrive when you use the unit on a regular basis. The more they work, however, the dirtier they get. When the air filters are too dirty, it can block air from flowing, which makes the entire cooling system less efficient. If the air conditioner has to work that much harder to send air through, it might even increase your energy costs. Regularly changing or cleaning the filters helps the unit function at its maximum potential and can even reduce its energy consumption by 5 to 15 percent. When the air filter is clean and functioning properly, it keeps dirt away from the evaporator and the condenser coil. If the filter is dirty, though, the dirt can make its way to the coil and negatively affect the system’s heat absorption capabilities. You should check the coils at least once a year to ensure they are not covered in dirt. You might want to hire a professional air conditioning maintenance company that can look over the system once a year and make sure it is ready for heavy use. An air conditioner has a draining system that lowers the humidity levels in the room. If the drain is blocked, moisture might start to build up, which can cause discoloration on the floor or the walls. You can use a wire to check the condensate drains to make sure there is no clog. Cool Breeze Comfort Solutions is your answer to everything air conditioning in Tucson. From yearly maintenance to system replacements, we know what it takes to keep you cool. To learn more about our services, call 1-844-550-5300. This entry was posted in Air Conditioning, Energy Savings and tagged swamp cooler, Tucson on February 10, 2013 by coolbreeze. Some common questions we might get is what the major difference is when choosing a way to cool your home, especially when it comes to certain climates like Tucson, Arizona. We hope to shed some light on some major differences, drawbacks, advantages and some information you previously may not have known. When it comes to home comfort, the name of the game in the Southwest is getting the air cold. Tucson winters are fairly mild and rarely do temperaturs drop below freezing, so heating typically isn’t the number one consideration when desert climates are concerned. We’ll try not to bore you with the a bunch of facts and introduce some basic concepts instead. On the surface, swamp coolers sound like they might work really well for desert climates. They work by using a blower – a fan at one end of the box – to bring in air from the outside and push it into the structure at the other end. Before the air goes inside, it passes through a series of damp pads, where evaporation takes place, and a small pump keeps the pads moist so the water doesn’t just evaporate away. This essentially creates a flow of air that is cooler than when it first entered the box. Swamp coolers are considered an an open system and rely on the flow of air throughout the structure to direct cool air. Air from the swamp cooler needs a way out and opening and closing windows and doors controls the air flow from the swamp cooler to different parts of the structure while central air conditioners use ducts to direct the flow. Swamp coolers can also use ducts in some cases, but they need to be larger than traditional air conditioner ducts to account for a greater flow of air from the swamp cooler. Too much humidity can prevent perspiration, which is how we cool ourselves naturally. Since swamp coolers work by putting water into the dry air, they act as humidifiers. This is great in dryer climates, because humidity can also be too low for comfort. Under the right conditions the water-laden breeze also can have a secondary effect of helping the skin’s perspiration, resulting in an even cooler feel than the swamp cooler would give on its own. Standard air conditioners also dry the air, condensing water vapor from the cooled room as it passes over the cold coils. The water drains outside, which is what the distinctive drip you feel if you stand under a window air conditioning unit long enough comes from. The result is a dryer room, and in humid climates, that can be a good thing. Under the right conditions the water-laden breeze also can have a secondary effect of helping the skin’s perspiration, resulting in an even cooler feel than the swamp cooler would give on its own. Standard air conditioners also dry the air, condensing water vapor from the cooled room as it passes over the cold coils. The water drains outside, which is what generates that distinctive drip you’ll feel if you stand under a window air conditioning unit long enough. The result is a room that is more dry. In humid climates, or in Tucson during the entire monsoon season, this is a huge advantage in comfort. Air conditioning units have also become amazingly energy efficient over the years. When comparing systems, make sure you are using data from newer systems that have much higher energy ratings than older legacy systems that use much more energy. This has also caused AC systems to become more affordable and smaller as well. At the end of the day, our recommendation for the comfort of your home for you and your family is an air conditioning unit. Despite the lure of purchasing a less expensive evaporative cooling system, it is true you get what you pay for. You will likely never meet a home owner that has gone from Air Conditioning to a Swamp Cooler and was satisfied with the change. You also can’t really combine the best of both worlds – the way each system works would cancel each other out, similar to running a dehumidifier and a humidifier in the same room. Don’t completely keep evaporative coolers completely off the table however. In cases where you have a small workshop, they can work pretty effectively. Because workshops typically have large openings like a garage door, these provide an effective source of airflow that basic cooling needs can be met. If the area does not need to be closed completely off like a detached office where a ductless air conditioning system, a swamp system might make sense. If you currently have a swamp cooler and are looking to significantly improve the interior climate of your home, give us a call at 1-844-550-5300 today and we would love to talk to you about your options. AC systems are far more affordable than people give them credit for, so don’t believe it’s out of your budget! This entry was posted in Energy Savings, Winterizing and tagged Energy Savings, Tucson on November 27, 2012 by coolbreeze. Reversing the direction your ceiling fan spins on low can help circulate warm air around the room. Homes can easily dry out in the winter months. Moisture in the air helps bring back warmth and to accomplish this, a simple humidifier running during winter months can keep the interior air from being dryer than usual. Also, from a comfort level, humidifiers can improve basic ailments like sinus problems. Since air with moisture in it holds heat better, a lower temperature can be just as comfortable and you can save in energy costs. If you find that a humidifier serves your needs well, consider getting a whole house humidifier. On sunny days (easy enough to find in Arizona), take advantage of the natural sunlight to bring in heat by adjusting blinds so they open and are tilted toward the ceiling. But make sure you remember to close the blinds at sundown. Fireplaces can waste a lot of energy. By pulling warm air out of the house through the chimney when not in use, it is an easy measure to forget. Make sure you close the damper when not using the fireplace, or you can install glass doors to help keep heat in the home. Exhaust fans, such as those found in kitchens, can pull warm air out of the home through the vent. Exhaust fans can also cause negative pressure inside your home that can lead to back drafts from your fireplace and can cause drafts through the walls, windows and un-insulated outlets in your home. Use them sparingly in colder months to save even more on energy costs. The best defense against heating problems is regular maintenance. We recommend year-round care with our home care packages. Having heating equipment serviced by a reputable company at least once a year could reduce your heating bill and prevent costly repairs and replacements in the future. A big part of our recommended plan is regular equipment inspections. Cool Breeze Comfort Solutions has been serving Tucson and Southern Arizona for years and our service is courteous and timely. Catching a potential problem early enough to either prevent a catastrophe or simply save a lot of money on a failing component, we are ready to serve you during the winter months! This entry was posted in Air Conditioning and tagged Goodman Air Conditioners, Tucson on February 3, 2012 by coolbreeze. Goodman provides both residential and light commercial air conditioning units for heating, air conditioning and products that maintain good quality indoor air. Goodman provides some of the most economical units in the entire industry. 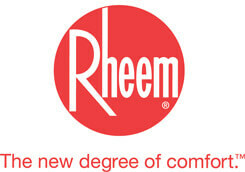 All Goodman air conditioning products are constructed to meet the original standards put in place by our founder. 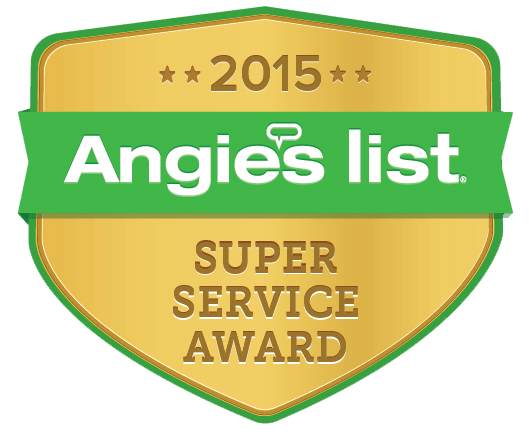 The warranties are among the finest in the entire industry. These factors have boosted Goodman brand products into a respected position in the heating, air conditioning and ventilation business today. A central air conditioning system is referred to as a split system. It has both outdoor and indoor components. Outdoors you have the compressor bearing unit. The coil is the indoor component. It is most often installed on top of the furnace. The compressor is powered by electricity. As it pumps refrigerant through the unit it gathers moisture and heat from inside the home and removes it, releasing it outside the home. The temperature inside the house is kept at a comfortable level due to the hot air and humidity being removed. When the warmer air from inside is blown over the indoor coil, the heat is transmitted to the surface of the coil. This is what cools or conditions the air. The heat collected on the coil is pumped to the outside and dispersed. The cool air is pumped back into the house to maintain the comfortable temperature the owner has selected. 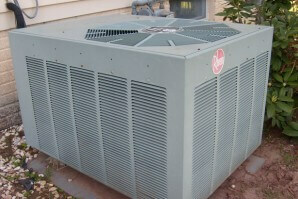 Another method of air conditioning the home is done through a package unit or heat pump. This entry was posted in Air Conditioning and tagged Air Cleaners, Air Filtration, Indoor Air Quality, Tucson on November 4, 2011 by coolbreeze. Your air cleaner is designed to keep your family comfortable and healthy, regardless of what contaminants make their way inside in your Tucson home. This is important because homes these days are sealed up tightly to minimize the loss of heating or cooling, but as a result they have poor ventilation and frequently they will suffer a buildup of excess contaminants like mold, dust, pollen and dander. To ensure you get the best possible air cleaner for your home, there are a number of measurements available to help you in the purchasing process. Let’s take a look at a couple of those measurements and what they mean. MERV ratings are used to measure the ability of a filter to remove dust from the air that passes through it. The higher the MERV rating, the better the filter works at removing particles. The MERV rating scale goes from 1-16 with 16 being the best possible rating you can obtain from a residential (non-HEPA) grade filter. Usually, they are designed to measure things like dander, dust, smog, wood smoke, spores, bacteria and mold. When choosing an air cleaner, it is recommended that you look for a MERV rating of at least 8, which is good enough to remove almost all common household contaminants. Higher MERV ratings (17 and up) are found in HEPA filters which are considered among the best on the market, able to remove particles as small as 0.3 microns. This rating stands for Clean Air Delivery Rate and is a measurement of how efficiently the air cleaner delivers clean air for tobacco smoke, pollen and dust (the common measurements given for each device). This is not a measurement of the efficiency of the device, so much as the speed of it the device. So, the higher the CADR measurement for all three contaminants, the faster those particles are removed from the indoor air. The best way to choose a device to match your needs is to look for a CADR rating of at least 2/3 of the size of the room you are cleaning. So, if you are cleaning the air of a 150 square foot bedroom, you should get a device with a CADR rating of at least 100. When choosing a good air cleaner for your home, make sure you do your research and choose on the best possible option for the space you need to clean. MERV and CADR allow you to do this. This entry was posted in Air Conditioning, Heat Pumps and tagged Air Conditioning Repair, Heat Pump Installation, Tucson on November 2, 2011 by coolbreeze. Thank you for the great service that your company provided for me. Your company came out to service my air conditioner, it was making a loud noise. Your service technician was at my house within the hour from when I called to set up my appointment. He was very helpful and professional. He was neat and lean he also left my house in perfect condition! I am amazed at how quiet our new heat pump system is. I just wanted to let you know that we are very happy with the service Cool Breeze provided for us. And I would recommend your services to anyone. This entry was posted in Air Conditioning and tagged Indoor Air Quality, Insulation, Tucson on October 24, 2011 by coolbreeze. By now you’ve probably heard how important it is to have good ventilation in your Tucson home. Especially if your home was built in the 1980s or early 1990s when ventilation issues were prevalent, you may not have enough clean air moving through your home. But, how much ventilation do you need? What is enough and if you don’t have it, how do you ensure your home is retrofitted properly? So, what does this mean for your home? It means in general that you need a lot of ventilation and that the best way to get it is through mechanical ventilation techniques combined with your air handler and ductwork. Especially if you recently added insulation and weather proofing to your home but have not yet updated your ventilation, you might have a major air quality problem, so have a Tucson professional measure your home’s air flow as soon as possible.